1 Metre 3 in 1 USB braided connector cable for data and power. 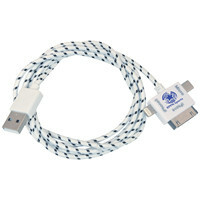 3 in 1 Cable includes 8 Pin, 30 Pin, and Micro USB cables suitable to use with current mobile devices on the market. Extra long cable length, makes charging in tight spots possible ie - bedside tables, back seat of cars.